Again another Special round because I'm going to be gone for a little while! For this round please choose 2 colors!!!!!!!!! IF you don't choose 2 colors you will only get 1 prize! Behind 1 color is 3 random cards. Behind 1 color is 2 random cards. Behind 1 color is 3 random crayons. Behind 1 color is 2 random crayons. Behind 1 color is 4 random cards. Behind 1 color is 1 random crayon. This round will end on September 8th! Behind Yellow is 3 random cards. Behind Brown is 2 random cards. Behind Blue is 3 random crayons. Behind Green is 2 random crayons. Behind Grey is 4 random cards. Behind Orange is 1 random crayon. Since I know many of you like Quilting, I have decided to give you a treat as a Special round for this last one! 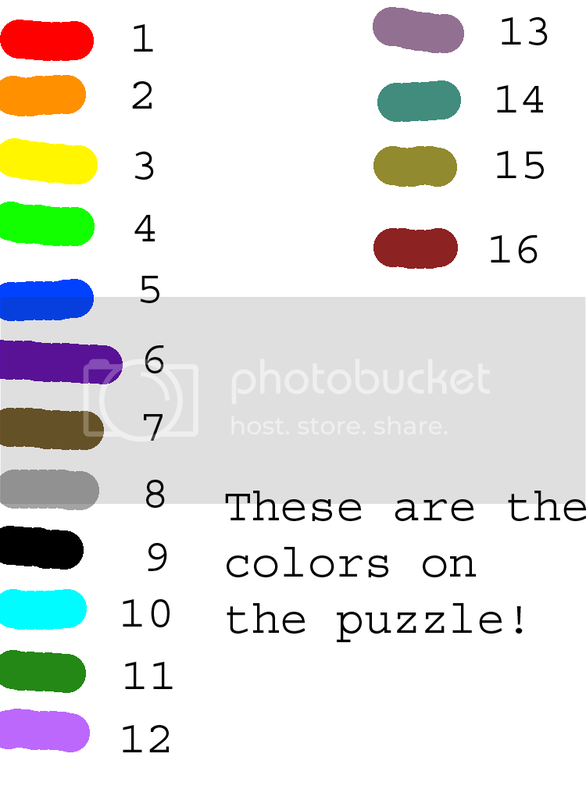 Here is a list of the colors I used on this puzzle! here it is! Actually the puzzle is quite large so I'm going to put it under a link as well. I fixed the puzzle! It should be correct now! Sorry for the confusion! Entire puzzle correct - 6 random cards and 2 random crayons! 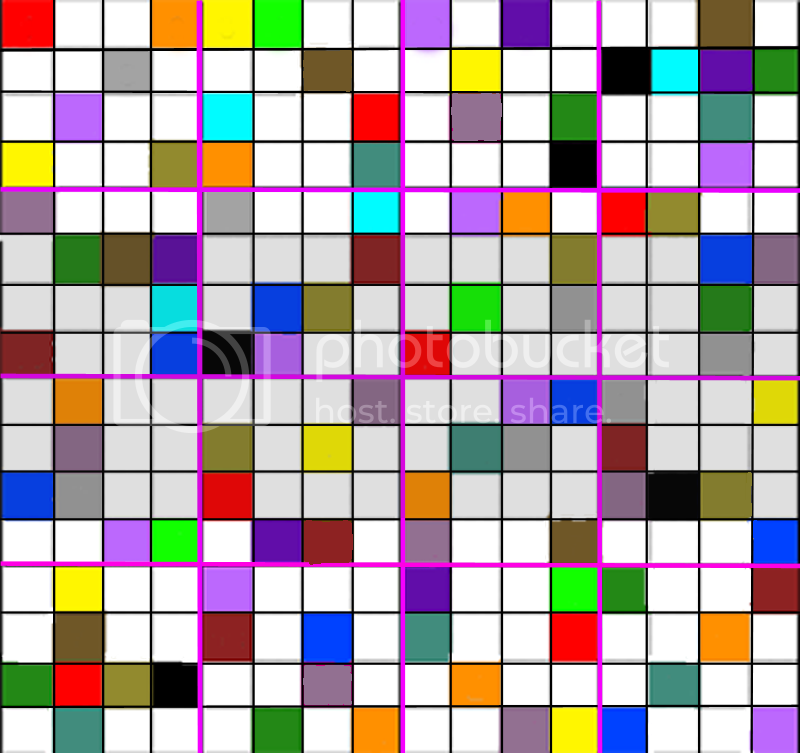 10 or less squares incorrect - 3 random cards and 1 random crayon. More than 30 squares incorrect - Nothing :( Do your best! I know it's late in the day and we are all finishing up our Colors League games but I just wanted to make a quick not here for everyone to see! First off, this weekend will be the LAST rounds of Pick a Color and Quilting to go up. So you guys get one more round! That is until I have finished moving out of the place I'm in and am settled in to this place. I'm hoping to only be gone with these 2 games for a few months at most. Secondly, in regards to me moving, when I do actually need to buckle down and pack (need to find a place first), and have a set date that I am moving there will be a back up mod that will be doing Recycled Art. So please everyone, welcome Allmia for that job! She is a back-up mod for me now! Her and I will be in contact as much as is needed! And I think that's actually it for now! Good luck on finishing up your games guys! Pick a Color is a luck based game where you pick one of the 8 colors and perhaps get a prize from it! Good Luck! Behind 2 colors is 5 random cards. Behind 2 colors is 4 random cards. Behind 2 colors is 3 random cards. Behind 2 colors is 2 random cards. This round will end on August 25th! Behind Purple and Grey was 4 random cards. Behind Green and Yellow was 3 random cards. Behind Orange and Brown was 2 random cards. Behind Red, Blue was NOTHING *SOB*. So this game works exactly like Sudoku does! All you have to do is fill out the colors on here instead of numbers! This round will actually end on August 25th! More than 15 squares incorrect - Nothing :( Do your best! Behind Purple, Brown was 5 random cards. Behind Orange, Yellow was 4 random cards. Behind Grey, Green was 3 random cards. Behind Red, Blue was 2 random cards. Hello guys! Sorry about being a couple days late with this one~ I had fun at my towns fair on Sunday though! Hey guys! Pick a Color went up right before this! This round will end on July 28th! Hey guys~ Last round was pretty fun, right? This round will end on July 28th! As I am out and about all day that day, I will post the new rounds on the following Monday or Tuesday! Behind Red and Grey was your 3 randoms and a crayon! Behind BROWN AND GREEN was your 12 random cards! Behind Orange, Yellow, Blue, and Purple was NOTHING. Welcome to Recycled Art~ Here, you can find old cards that have been exchanged in at the Art Shop, from members who have quit, etc. It's pretty simple- just choose which cards you'd like to claim, and you get them! You don't have to exchange anything for them! Please comment here and not on the old post please! 1. You may claim 6 cards a week. Note that this can change at any time depending on how many members there are and how many cards there are in here. 2. You may only claim cards once a week, no more than that. Example; If you post on Wednesday you cannot post again till the next Wednesday. 3. First come first serve. Meaning that if someone else claims that card before you, they will get it and not you. So look at the comments above you. 4. Do not thread comments unless I comment back. If you cannot edit your comments please delete and re-post. 5. Please do not ask for cards that I have not updated with yet. (IE cards that are left for me in comments) This makes it fair for all players and makes it much less confusing for me. 7.NEW RULE!!! When you edit your comments, please make sure that NO ONE after you has claimed that card. As they claimed it first, they should get it first. 9. Please comment here with what you are claiming. That's it for now but these rules are subject to change at any given time I feel like they need to be changed. Okay so we have the site up and running for you guys! Here's your link! RECYCLED ART! Comments still go here, okay! Recycled art is now Open!!! Hey hey! Pick a Color went up right before this! This round will end on July 14th! 1) Thank you all for being understanding and wonderful people. I really needed that week off of TCG stuff! But I'm back up and running again! 2) Thank you all again for the birthday wishes! I forgot to say Happy Birthday to Ouji as well, who shares the same b-day as me! So Happy Belated Birthday Ouji <3! 3) HAPPY CANADA DAY to all of you Canadian players! Behind 2 colors is 12 random cards. Behind Red and Grey(for Canada Day) is 3 random cards, and 1 random crayon. Choose wisely! You could win a lot or you could loose it all, but there is a guaranteed prize here as well! Behind Green&Blue was 5 random cards. Behind Purple&Yellow was 4 random cards. Behind Orange&Red was 3 random cards. Thank you all for being wonderful! This round will end on June 23rd! Behind Brown and Red was 6 cards. Behind Purple and Orange was 5 random cards. Behind Green and Blue was 4 random cards. For anyone who commented on Pick a Color 73! There were some people who commented on the DW post after it was imported here but I answered comments on the LJ post because I didn't realize that had been done until afterwards. IF I DIDN'T ANSWER YOUR COMMENTS on either Pick a Color 73 or Quilting 47! Please link me here to your comment and I will answer them for you! Thank you so much! This confusion will never happen again as everything is now on DW and not both! Hello hello, Pick a Color went up right before this! This round will end on June 9th! First off thank you for the few comments that gave me advice! This game will be staying bi-weekly as long I run it, only because I don't have time to be posting every week. As well as more interesting prizes, I try to do that for the special rounds but maybe I'll do special rounds every 5 rounds instead of 10 from now on? How does that sound? Behind 2 colors is 6 random cards. Behind 1 color is NOTHING. Behind Brown and Purple was 5 random cards. Behind Green and Orange was 4 random cards. Behind Red and Blue was 3 random cards. Behind Grey and Yellow was 2 random cards. This round will end on May 26th! I want to up the popularity of this game again, any ideas of how I could do it? I'll give you 1 random card for answering that question! Behind Purple and Red was 4 random cards. Behind Grey and Yellow was 3 random cards. Behind Orange and Green was 2 random cards. Behind Blue and Brown was 1 random card.